Daily Pretox Capsules is the indispensable helper assists with the detoxifying process and helps to clean your urinary system prior to a urine drug test. Daily Pretox capsules are designed to be used in conjunction with other Supreme Klean detox drinks or Quick Flush Capsules to aid in detoxification and should not be used alone to pass a drug test. Daily Pretox cleansing capsules are formulated for daily use and are gentle yet effective. 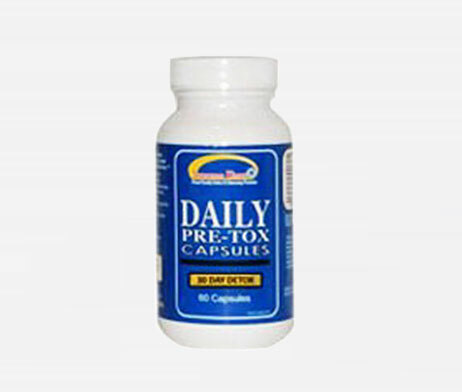 About Daily Pretox Capsules: Daily Pretox Capsules will help get a head start on any emergency detoxification regimen, remember it is not a replacement for other detox products. It is an effective compliment to them. Intended for daily use, this product enhances the effectiveness of one of our other great detox products. Also great for those interested in a maintenance detox program or daily cleansing procedures and healthy way of life! 100% natural. Safety and freshness sealed.